The cultural hallmarks of India and its people have always been woven into the fabric of director Wes Anderson’s aesthetic. Chief among Anderson’s earliest influences were the films of iconic Indian director Satyajit Ray, and actors like Kumar Pallana and Waris Ahluwalia are prominently featured throughout the young auteur’s feature work. In the mid-2000’s, Anderson was caught in the grips of a creative wanderlust, setting his stories in exotic lands and far-flung seas. Whereas 2004’s THE LIFE AQUATIC WITH STEVE ZISSOU was inspired by the numerous Jacques Cousteau documentaries Anderson had grown up on, the idea for his fifth American Empirical production would be informed by his fascination with Satyajit Ray’s work as well as Louis Malle’s documentaries about India. After one of Anderson’s influences– Martin Scorsese– screened Jean Renoir’s THE RIVER (1951) for him, his desire to travel to India and set a film there was cemented. From Owen Wilson to Noah Baumbach, Anderson has always chose interesting and inspired writing collaborators for his projects, and for this new endeavor, he enlisted the help of his RUSHMORE (1998) star Jason Schwartzman and fellow filmmaker Roman Coppola (son of Francis Ford). They travelled all over India by rail, taking in the culture and customs of the countryside as they hammered out the script for what would become THE DARJEELING LIMITED (2007)– arguably the most divisive film amongst the director’s loyal following, but also just maybe his most heartfelt and insightful. THE DARJEELING LIMITED was produced by Anderson, Roman Coppola, Lydia Dean Pilcher, and prestige-film super-producer Scott Rudin– a pedigree that gave Anderson and company the money and resources to shoot entirely on location in India. The story concerns the Whitman brothers, a trio of malcontent adults each caught in the grips of their own stunted neuroses, as they rendezvous in India under the auspices of “a spiritual journey”. This journey– really more of a meticulously over-planned itinerary of stops– occurs along the track laid out before the titular Darjeeling Limited, a rickety passenger train steeped in a kind of old-world romantic glamor. As they soak in the warm beauty of their surroundings and encounter various urban and tribal dwellers, their cramped living quarters on the train amplify each brother’s particular idiosyncrasies and reveal the underlying psychological reasons for their strained relations. When their squabbling gets them kicked off the train entirely, they set out to find their mother, who is preaching Christianity at a convent up in the Himalayas. Their ensuing journey causes each brother to reckon with his own internal demons, and finally allows closure on the disconnect that’s been driving them apart for so long. THE DARJEELING LIMITED is a pared-down film in every sense of the word, especially in regards to the cast. Instead of the sprawling ensemble of eccentric characters that defined THE ROYAL TENENBAUMS (2001) and THE LIFE AQUATIC WITH STEVE ZISSOU, Anderson downsizes to three leads and a small scattering of supporting cameos. For two of the three brothers, he reaches all the way back to his earliest work and casts his old college roommate and BOTTLE ROCKET (1996) star Owen Wilson, and his RUSHMORE lead Jason Schwartzman. Wilson plays Francis, the eldest Whitman brother, who’s tendency to be proactive and make plans on behalf of his brothers has grown into an overbearing bossiness (that ironically plays like a mellower, grown-up version of Dignan from BOTTLE ROCKET). At the start of the film, Francis is still recovering from a motorcycle accident that he eventually reveals was a suicide attempt (a freaky story development considering Wilson’s real-life suicide attempt around that time), and as such, Wilson spends the entirety of his screen time hobbling around in bandages and braces like a mummy. Schwartzman plays the youngest brother, Jack. Jack is an aspiring novelist who writes thinly-veiled fictional accounts of the people in his life. Schwartzman is playing the same character we saw in Anderson’s previous short, HOTEL CHEVALIER (2007), and THE DARJEELING LIMITED expands the character into a brooding young man who takes himself way too seriously. Anderson company newcomer Adrien Brody is caught in the middle as the third Whitman brother, Peter. Peter is somewhat of an emotional drifter, losing himself in a reverie brought about by painkiller abuse and his dead father’s early possessions. He’s about to be a father himself, and his whole reason for coming to India was to come to terms with that fact while escaping some of the pressure of his impending life change. Brody turns in a natural, nuanced performance that grounds Wilson and Schwartzman’s particular eccentricities. Despite none of the three men looking anything like each other, their natural chemistry together is entirely convincing as a trio of brothers with a long, complicated history. Even though he’s in an exotic, unfamiliar land, Anderson surrounds himself with friendly faces from his stock company of performers. Anjelica Huston puts in her third consecutive appearance in an Anderson film as Patricia Whitman, the boys’ mother. Patricia is an interesting character who has achieved the spiritual enlightenment that her sons seek, imparting her wisdom in an unadorned, no-nonsense syntax. Bill Murray makes a small cameo as a businessman who rushes to make his train. The fact that Murray flew all the way out to India for what probably amounted to one day of shooting speaks volumes about their creative relationship, not to mention their their mutual love and appreciation for each other. Waris Ahluwalia and Kumar Pallana also appear in bit roles, Ahluwalia as the stern, humorless Chief Steward aboard the Darjeeling and Pallana as a nonspeaking passenger. 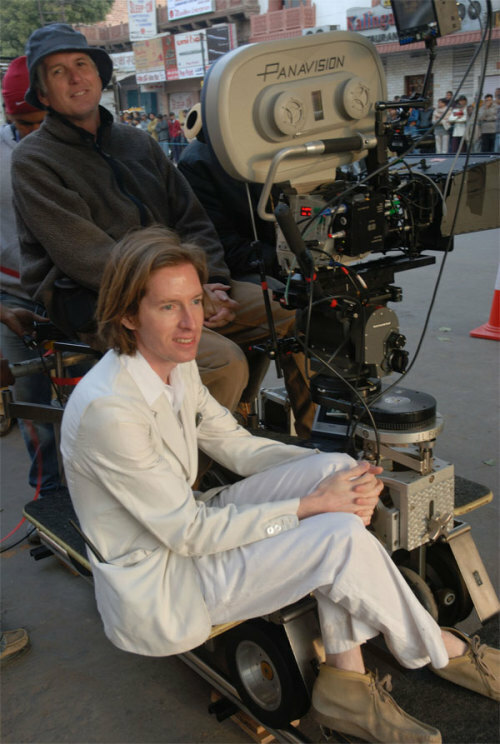 Of all of Anderson’s regular technical collaborators, only cinematographer Robert Yeoman and production designer Mark Friedberg lend their talents to THE DARJEELING LIMITED. Having shot all four of Anderson’s previous features, Yeoman is well-versed in the director’s signature aesthetic and is able to faithfully replicate it here, despite the streamlined production circumstances. Shooting on 35mm film in the anamorphic aspect ratio, Anderson and Yeoman capture the panoramic Indian vistas with much more handheld camerawork than the director has previously employed. This is due to the filmmakers having far less control over their locales than ever before– indeed, the entire production of THE DARJEELING LIMITED was something of a run and gun operation. Most of the “classical” Anderson-ian stylistic flourishes can be found in the train sequences, where he could exert the most amount of control. The train itself was bought especially for the production and renovated by Friedberg to better reflect Anderson’s particular tastes as well as his own perception of Indian culture. This approach allows for an image that trades in bold swaths of yellow, blue, green, and red– accurately capturing the vibrant pops of color that dot the dusty Indian landscape. These sequences also allow Anderson to employ lateral camera-movement to convey the diorama/proscenium effect he’s so well-known for. Outside of the train, Anderson peppers other signature techniques like rack zooms and whip-pans wherever he can in a bid to render his scenes in as few individual shots as possible. While other aspects of Anderson’s style– slow-motion ending shots, symmetrical compositions, and top-down hand inserts, etc.– are just as present as they’ve ever been, THE DARJEELING LIMITED also sees Anderson toning down lesser conceits, such as otherwise eccentrically-dressed characters making do with simple suits in limited shades of gray. Whereas Anderson’s usual tendency to arrange his tableaus in compartmentalized, dollhouse-like configurations runs the risk of sucking the spontaneity or immediacy from a scene, THE DARJEELING LIMITED’s embrace of verité cinematography results in one of the most lively and vibrant mise-en-scenes in the director’s career. Mark Mothersbaugh, the composer of Anderson’s previous four features, does not return to provide THE DARJEELING LIMITED’s musical soundtrack. Anderson foregoes an original score entirely, opting for a mix of carefully-selected tunes that reflect both the Indian setting as well as his own eclectic tastes. Most of the film’s music is sourced from notable Indian films from directors like Satyajit Ray and James Ivory, giving the film an authentic sense of place and character that most modern composers would strain to emulate. Like Martin Scorsese before him, Anderson unifies his body of work with the incorporation of classic rock from the likes of The Kinks and The Rolling Stones, the latter of whom’s track, “Play With Fire”, is used to particularly resonant effect during the scene in which the Whitman boys achieve their own version of spiritual enlightenment by just shutting up for once and reading each other’s eyes. Curiously, Anderson indulges in his own personal Francophile affectations by including Joe Dassin’s “Aux Champs Élysées” and the distinctly-Parisian “Where Do You Go To My Lovely” by Peter Sarstedt (which was also used prominently in the film’s companion short, HOTEL CHEVALIER). On its face, one would think the juxtaposition of French music against an Indian setting would be incongruous, but Anderson’s inspired pairing actually comes across quite naturally. THE DARJEELING LIMITED may be set within a culture that’s radically different than anything Anderson has ever explored, but the director’s thematic fascinations apply just as well in India as they do in Texas, New York, or Port Au-Patois. Sibling rivalry, a theme that obliquely courses through all of Anderson’s films, rotates front and center here in a narrative that hinges on the brothers’ somewhat antagonistic relationships to each other. The Whitman boys may be grown adults, but their constant bickering and squabbling lets us know that they still have a lot more growing to do. Anderson’s uniquely bittersweet approach to heavy story elements like suicide, regret, and the fear of change gives the film an emotionally-resonant charge that contrasts with the bright, airy visuals. One of the more striking moments of the film concerns the aforementioned silent spiritual enlightenment sequence. Set to The Rolling Stones’ “Play With Fire”, Anderson’s camera gently pans across the faces of the Whitman brothers and their mother before transitioning to a train, where several vignettes have been set up in the various compartments. We dolly laterally alongside the different compartments, each one containing a previously-seen character experiencing a moment of solitude and reflection. Anderson’s logic becomes more dreamlike as each compartment passes by, with the tableaus resembling decidedly non-train settings like an airplane, or a French hotel room, or the dense Indian jungle…. complete with an animatronic tiger. This sequence, while admittedly a little baffling from a literalist perspective, is indicative of Anderson’s growing confidence in the magical capabilities of cinema and establishes a firm foundation that he’d build upon in the fanciful, highly-exaggerated reality of his subsequent features. THE DARJEELING LIMITED premiered at the Venice Film Festival, where it won the Little Golden Lion award. When the film made its stateside debut, it was met with mixed reviews. Most were generally favorable, riding on the critics’ established goodwill for Anderson as an artist. Amongst Anderson’s cultish following, however, THE DARJEELING LIMITED is perhaps his least-loved– for all sorts of reasons, both trivial and integral. To focus on the film’s shortcomings, however, is to miss the point. For a director so notorious for exerting an unrivaled amount of control over his images, THE DARJEELING LIMITED is an important film in Anderson’s filmography precisely because he makes the conscious decision to cede that same control to the wild unpredictabilities of a foreign land and culture. The film is a product of a director in transition: his wanderlust phase was coming to an end, and there was a need to return home and retool his aesthetic because of diminishing returns. Despite its popular perception as an albatross hanging over Anderson’s work, THE DARJEELING LIMITED is an earnestly genuine and optimistic exploration of spirituality and rebirth. In a way, the film served as an artistic cleansing for Anderson himself, in that the production process renewed his energies and recommitted his spirit to making great work. THE DARJEELING LIMITED is currently available on high definition Blu Ray via The Criterion Collection.